Learn about the types of people who become diagnostic medical sonographers. This page goes into detail about the ethnic and gender ratio of the workplace. The largest ethnic group of diagnostic medical sonographers are White, making up 58% of the population. The next highest segments are Hispanic, Latino, or Spanish and Other, making up 14% and 9% respectively. This graph shows the distribution of females and males that are interested in becoming a diagnostic medical sonographer. Four or five star ratings on CareerExplorer indicate interest. More women than men are interested in becoming diagnostic medical sonographers at a ratio of 1.96 to 1. 89% of diagnostic medical sonographers are female and 11% are male. This is one of the most compelling statistics we collect. Gender bias shows the difference between gender interest in being a diagnostic medical sonographer and the actual gender mix of people in the career. 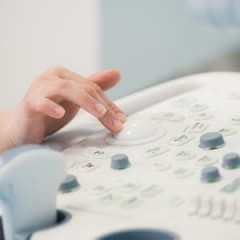 If there is a significant difference, then it means there is a gender imbalance between those interested in becoming a diagnostic medical sonographer and those who end up becoming one. In this case there are significantly more men interested in becoming a diagnostic medical sonographer than those actually working as one. It is hard to pinpoint the exact reasons why, but there are likely various forces at play, from changing interests over time to societal norms and biases.